Is it a bird? Is it a lamp? ‘Bibibibi’, one of the later works by Ingo Maurer, was a cheeky reaction on the modernist movement of the early eighties. Surrounded by the slick minimalism of artists like Donald Judd, Dan Flavin and Frank Stella, Maurer wanted to create a lamp that was exactly the opposite. Bibibibi is not only absurd in its image, but also in the material it is build of. The plate consists of porcelain, the legs are plastic, the bird’s body is metal and the top is fully made out of soft feathers. Especially the porcelain is a unconventional material to use with lamp-making and it makes the lamp almost afunctional, even though the light of the lamp, the bulb itself, is one of the most standard. The anti-functionality – the case that it can hardly be moved – makes the strongest comment on the minimalistic design of the beginning of the eighties, which was very much focused on the ability to use the object in every way desirable. Of course also the suggestion of some kind of narrative makes this lamp stand out compared to its contemporaries. It makes us wonder: what kind of bird does it represent? Is ‘bibibibi’ the sound it would make? What has the bird been through? Was there a certain background for Maurer to make it? Is there even a story behind it? In my case it particularly reminds me of a character from one of the most famous Dutch children books, called ‘Pluk van de Petteflet’ by Annie M.G. Schmidt. This character is also a bird, but a rare species, which the people call ‘the Krullevaar’. Because this bird is so exceptional, the director of the city’s museum wants to make sure it will be in his collection, but then stuffed. The protagonist, Pluk, naturally saves the Krullevaar from this sad ending. However, this is exactly what happened to ‘Bibibibi’, he or she eventually ended up in a museum. 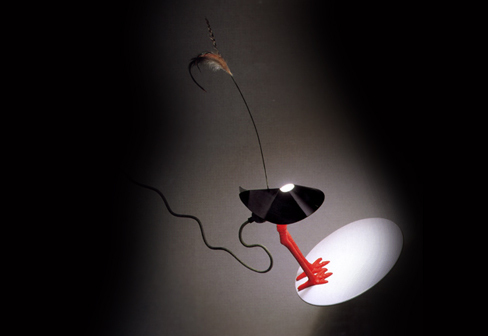 Maurer initially succeeded in creating a lamp that was absurd enough to differ from the rest, but exactly because of this it landed in the Stedelijk, which only increases the lamp’s anti-functionality. This finishes Maurer’s wish to create something unique: the bird is caged and so is the design.